“Off the earth’s long contour, her river-veins” Environmental art installation by Alastair Noble. As you’ve seen by our recent posts, Autumn can be a sensory experience inspiring thoughtful haiku and beautiful art. Autumn can also be a peaceful time whether it’s reflecting the dramatic change of view outside your window or wandering through a wooded park or sanctuary. But, it’s not just about haiku. Poets, artists, musicians, scientists, writers—all of us, really—have something to say about nature and its effects on us. Sunset along the Old Erie Canal—the stone wall at Cedar Bay Park. 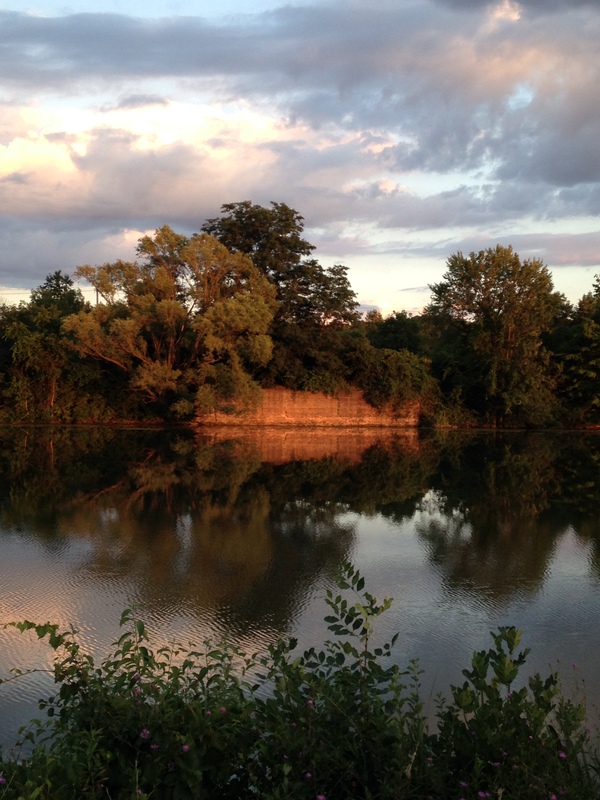 Locally, you can discover art and poetry in nature by walking any of the trails along the Old Erie Canal. The rough, hand-hewn stone bridges and aqueducts built by our immigrant ancestors are still a thing of beauty…as are the walkways and paths along which one can still become inspired by the surrounding natural beauty of the old waterway. Or, you might find the Stone Quarry Hill Art Park in Cazenovia more to your liking. With beautiful vistas and inspiring installation art, the park offers many opportunities for your inner artist or poet to come alive. Speaking of installation art, you may remember Christo and Jeanne-Claude, whose masterful displays continue to inspire thoughtful reflection. If you had the opportunity, you’ll agree that the singularly unique experience of walking through their 2005 installation of The Gates in Central Park was exhilarating! If you have travel plans over the holidays, or even next Spring, check out the more subtle experience of installation art found at the Marsh-Billings-Rockefeller National Historical Park in Woodstock, Vermont. In 2013-14, the park’s artist-in-residence, Alastair Noble, installed environmentally styled works throughout the park. Consisting of ten large ash and pine logs—planed on one side—Noble inscribed them with fragments of literature and poetry using Poe, Nietzsche, T.S. Eliot, Wittgenstein, and Shakespeare as his inspiration. As you walk around the park, you come across the logs here and there—at first impression, mere logs. It’s delightful how they turn up randomly, and the brevity of their inscriptions reminds us of haiku. This incompleteness invites a kind of filling in, especially in association with the natural setting. For a newspaper story about Noble’s art residency, CLICK HERE. If you like your environmental poetry more fleshed out, you can also hike around the Marsh-Billings-Rockefeller Park’s Robert Frost Poetry Trail. Thirteen poems—complete and presented in conventional page-like formats—line the walking trail. They seem a little like homework assignments dogging you into the woods. One wonders what Frost himself would say about these woodland installations. Would he prefer them here to, let’s say, his poems printed on subway placards? The poem, Come In, is one of 13 poems found on the Robert Frost Poetry Trail. We are, of course, very proud of our own distinctive version of installation art. Our beautifully illustrated haiku posters can be found year round in the many brightly decorated kiosks dotting downtown Syracuse NY. If you like discovering poetry in the environment, or are fascinated by installation art, send us your photos and thoughts—we’ll share them here with our followers.